Swurl is yet another RSS aggregation service that I just discovered. it has the usual list view (see seeminglee.swurl.com) but also a timeline view that places your activities around the activities themselves, instead of locking them into a calendar view. I like this. Unlike most services which requires you to go about to invite your friends to join the service, it fetches your contacts from various services into the friends list automatically. More goodies > FriendFeed is that Swurl apparently imports your complete set of Flickr data, not just recent stuff like FF. In this sense, I can see Swurl function better as a history trail. Woah, this is wild. Nice find. 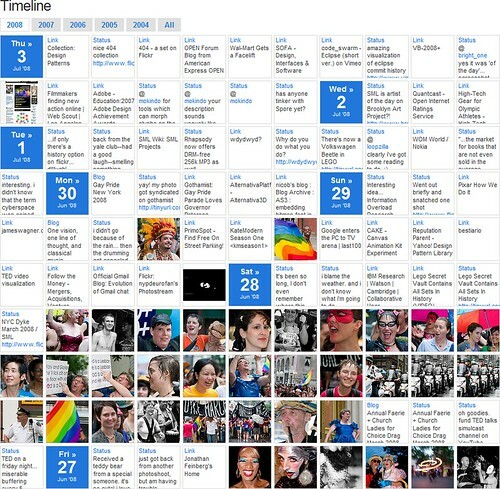 Timeline visualization is the future? @Josh-Klein Is timeline visualization the future? I think that nothing alone can be the future. I do believe that if one is to look at one's history and try to decipher relative importance of events, it's helpful to look at the date where those events happen. But time is only one factor. There's also people + places + objects. It would surely be interesting to visualize one's history with respect to other people's timeline or timeline of another place / news + events. Timelines will continue to serve as an important component in visualizing history, for sure, but alone by itself might not do much good. It would be interesting, for example, to chart one's happiness overtime with respect to events that happen to that person, in kind of combo a la stock charts + news events.